This event [Pentecost] does not portray the triumph of orthodox Christianity (as the theologians believe and teach), but signifies the universal dissemination of the Christ consciousness throughout all time in the heart of every human being; to this the words and promise, "Lo, I am with you all the days, even until the end of the world," bear witness. 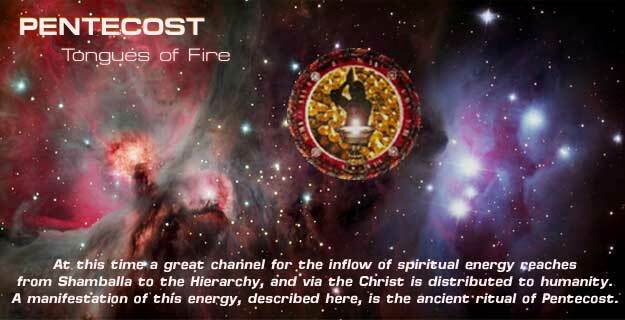 It is at this point ~ being raised in consciousness to an awareness of God in all humanity, and all humanity in God ~ that we receive the baptism of the holy fire. The light, the "tongues of fire," descend and rest upon our heads, bringing illumination. Those so illumined feel and know the power of the Holy Spirit. Our vision and understanding are quickened and our one desire is to serve humanity. We now live not for ourselves, but that our life may bless others. When we receive the holy blessing, we are then an ambassador of God, and go forth into life to serve, to uplift, to heal, to comfort. We are a chosen one of God in the service of humanity, just as the apostles who went out to spread the Word, following the Pentecost. This thought we would commend to you, that the development of your own being is not for your own sake, but so that you can render service to life, so that you can more adequately give. & All the Time & Spaces! When the day of the Pentecost had come, they were all together in one place. And suddenly from heaven there came a sound like the rush of a violent wind, and it filled the entire house where they were sitting. Divided tongues, as of fire, appeared among them, and a tongue rested on each of them. All of them were filled with the Holy Spirit, and began to speak in other languages, as the Spirit gave them ability. The emphasis in the Aquarian Age will be on life and freedom from the tomb of matter, and this is the note which will distinguish the new world religion from all that have preceded it. The Festival of Easter and the Feast of Pentecost will be the two outstanding days of the religious year. Pentecost is, as you must well know, the symbol of right human relations in which all men and nations will understand each other and ~ though speaking in many and diverse languages ~ will know only one spiritual speech. The fact of the resurrection will be demonstrated during the next few centuries, and the Living Christ will walk among men and lead them onward towards the Mount of Ascension. The Pentecost will become truth. All men will come under the tide of inspiration from on high, and though they may speak with many tongues, they will all understand each other. The Pentecost this cycle is observed Sunday May 20, 2018.